In Summer 2009, Gina Bradley launched her Stand Up Paddleboard business, Paddle Diva. Her timing was perfect — the sport was just starting to take off in a big way. Based in East Hampton, New York, Paddle Diva was among a handful of local businesses offering SUP lessons throughout the beach resort towns of Eastern Long Island. Bradley saw a niche amidst the competition: she would target women, marketing the health and wellness benefits of the sport as well as its recreational appeal. Bradley’s first two years in business were successful enough for her to invest in a professionally designed website. Her website launched just as peak paddling season got underway in May 2011. The website was Paddle Diva’s primary marketing piece — a beautifully branded and visually compelling website with an easy-to-use content management system that allowed Bradley to manage and update site content herself. But by early July, even with this beautiful new website, Bradley sensed her customers were not finding her online. She was Googling “stand up paddleboard Hamptons” and “SUP Long Island” and seeing her local competitors’ websites listed on the search result pages (SERPs) — but not Paddle Diva. Paddle Diva lacked a physical address so the business was not showing up in local searches; that is, searches conducted by folks seeking services in a specific geographic area (i.e., “stand up paddling lessons in Montauk”). With the season halfway over, it was very important to do everything possible to get Paddle Diva ranking quickly for some important keyword phrases. In order to accomplish this, we developed a locally focused SEO campaign to kick things off. 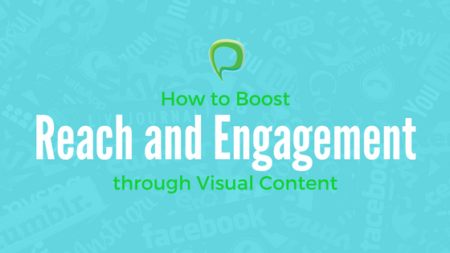 Through the first few weeks of the engagement, Panoptic Online Marketing conducted thorough keyword and competitive research. Determining which keywords would yield the greatest number of visits to the site — without being overly competitive and difficult to rank for— was the first step. Incorporating these carefully selected phrases into the on-page copy and meta data was the second. We revised much of the content on the site, performing basic on-site optimization, making sure pages were properly indexed by Google and taking care of all the things necessary to ensure healthy organic rankings and growth. Lastly, we provided SEO copywriting guidelines and ongoing coaching for Bradley, who drafts the majority of her own website copy. To get some fast, quality backlinks, we claimed and optimized as many local business directory listings as possible — but anyone can do that for themselves. The benefit of doing the proper research first is to tease out opportunities that aren’t always obvious, even to the SEO expert. In this case, we tried to mitigate the lack of a physical location by obtaining backlinks to the website naturally and associating Paddle Diva with civic associations, non-profits and grassroots environmental groups on the East End. These were communities that Bradley already belonged to or supported and most of them were pleased to offer a link back to the Paddle Diva website. 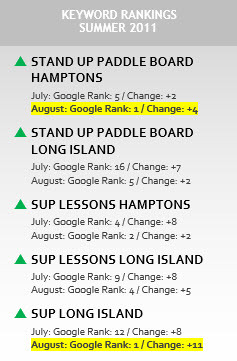 By Labor Day Paddle Diva was dominating Google’s first page for upwards of 25 keywords related to stand up paddling on Long Island and in the Hamptons. With these simple first steps, Panoptic Online Marketing was able to help Bradley leverage her new website to obtain the maximum possible organic traffic within a short timeframe. The season was a huge success, with over 4,300 Unique Visitors to the website and solid bookings for stand up paddle board classes and tours through the beginning of October. Revenue doubled over the previous season.